Yesterday was May the Fourth, the day where phonetic similarity gives us all an excuse to do the thing we were going to do anyway, enjoy Star Wars. In a similar, but much more giving vein, Mark Hamill also used Star Wars Day to do what he was going to do anyway, give back to sick children and just be a generally awesome human being. He spent May the Fourth at Guy Hospital in England visiting some Star Wars fans and it looks like he had more fun than anybody yesterday. Mark Hamill wasn’t alone as he brought some of his Star Wars droid buddies with him to visit the kids in the hospital. The smiles on the faces are contagious. It’s truly touching to see the joy that is being brought to these children, many of whom have serious and long term conditions. Yet, here they are smiling away. Wouldn’t you? Luke Skywalker is there, man. Mark Hamill did more than simply make this trip himself, he appealed to others to do their part as well. In an editorial in The Sun, the Star Wars: The Force Awakens actor asked readers, and by extension everybody, to do their part to help out, too. You can’t believe how good it feels to help others. I want everyone to experience that for themselves. I would appeal to Sun readers – if you have ever derived pleasure or inspiration from the brilliant Star Wars movies, send a little of that back – not to me but to somebody who really needs it. May the Fourth was also the last day of the latest push for Force for Change, the charity initiative set up by Lucasfilm to take the combined efforts of Star Wars fans all over the world and unite them in a good cause. It’s clear from his words that Mark Hamill truly believes in this. He speaks in his editorial about how his own brother is a doctor, and his job as an actor seems trivial in comparison to the fights that some of these children have to go through. Yet, he knows that the movies that he has made are important to people, and so he uses that to do what little he can to bring some joy. Hang on, there’s something in my eye. This isn’t the first time Mark Hamill has taken the time to visit hospitals, it won’t be the last either. We look forward to even more pictures of smiling kids holding lightsabers. Also, if he really did talk to them about Star Wars: Episode VIII we totally want to make friends with all of them. There have been huge developments on the Star Wars front this week, from the casting of a new Han Solo (!!) to news on Star Wars: Episode VIII. Want to catch up on all things Star Wars? Read on! Earlier this week, we found out the new actor who will be playing Han Solo in a standalone prequel movie. We think it’s a PERFECT choice. Do you agree? We also know a great deal about Luke Skywalker’s role in Star Wars: Episode VIII. Click here to learn those details. And we know what Daisy Ridley will be doing in Star Wars: Episode VIII, so click here to find out what’s in story for Rey. 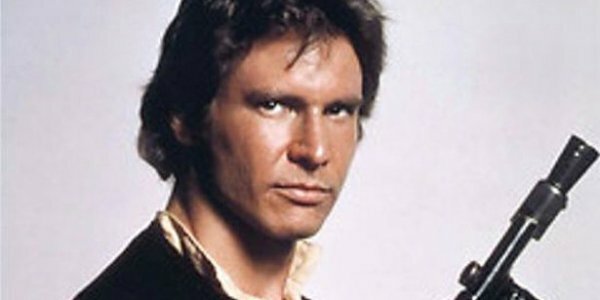 Long before Han Solo gets his own movie, we’re going to see a pre-New Hope story in Rogue One: A Star Wars Story. Want to learn a good deal about that movie? Here’s Everything That We Know About Star Wars: Rogue One!